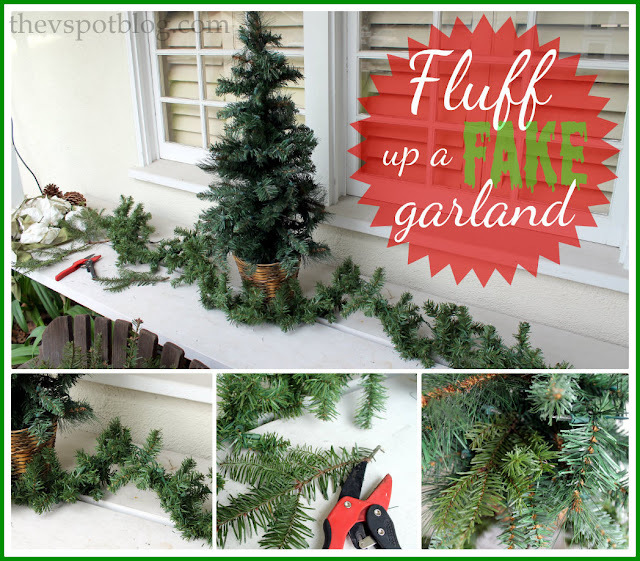 Sprucing up a fake garland with real greenery. 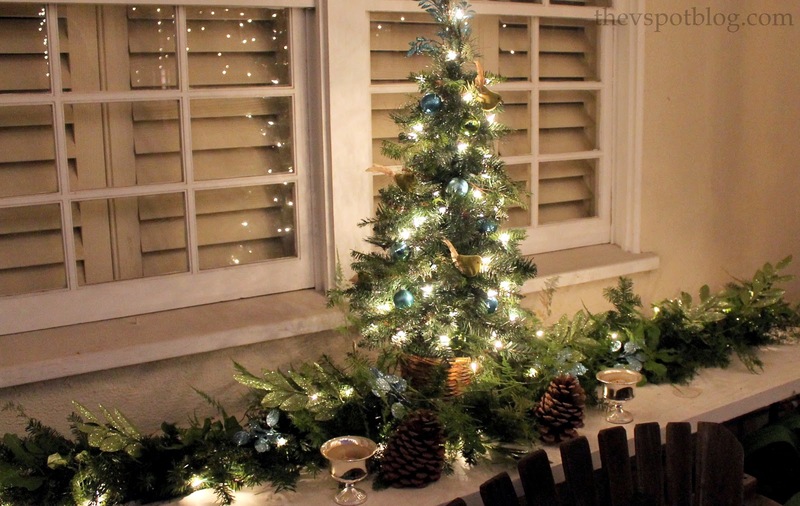 Yesterday I shared how much I love the Christmas tree clippings that you can get at your local tree lot, and showed you the little “planters” I made using the cuttings. Using the same cuttings, it’s very easy to take a cheap, cheesy plastic garland and make it look spectacular. This started out looking pretty dang pathetic, but those pre-lit plastic garlands are really difficult to beat as far as the price and the fact that they serve as a good base. To begin, stretch out the garland where you want it. Make sure it’s where you want it, because you can’t move it. (In this case, an odd little ledge right outside of our front door.) Just start clipping away at the (FREE!) 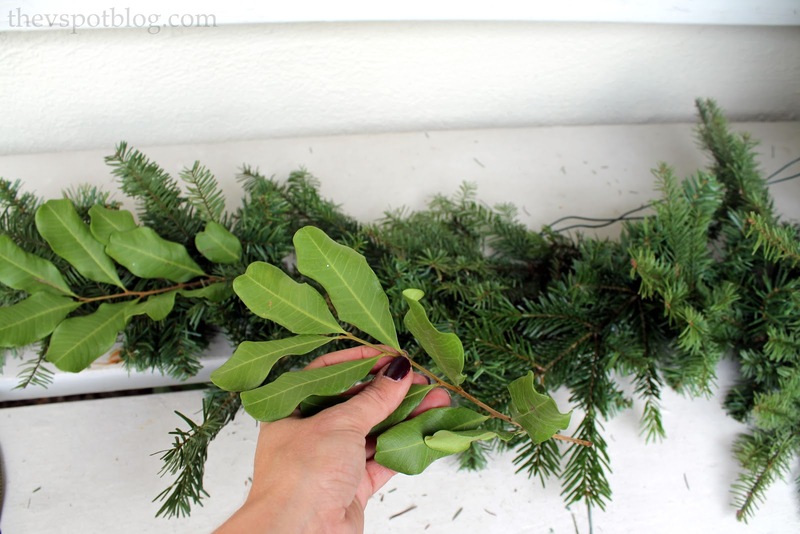 Christmas tree cuttings and tuck them into the garland. I added them to the little pre-lit tree as well. 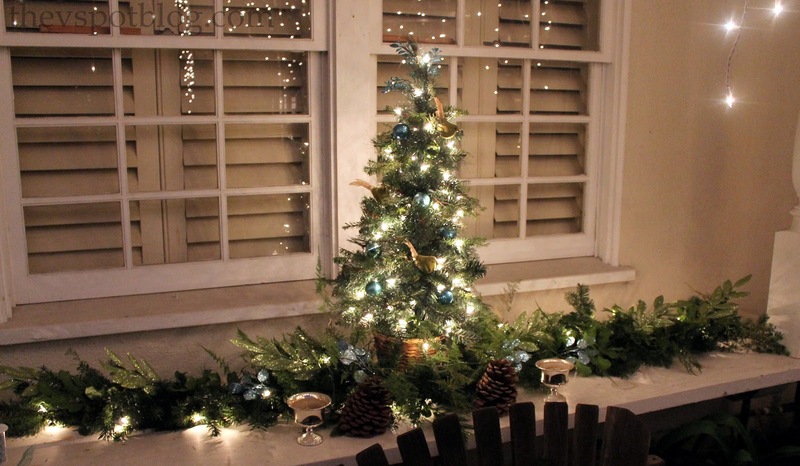 Once I fluffed up and filled out the fake garland with the Christmas tree cuttings, I started adding other greenery from the yard. Once I added in all of the greenery I thought it needed, I added in some sparkly floral picks and ornaments in my Christmas colors of green and blue. I think the end result looks pretty good! What a great way to get the look of real with the convenience of fake. I suppose you also get that nice real tree smell as well. Do the clippings hold up pretty well? I just have visions of pine needles dancing in my head. So beautiful! And yes the extra totally changed the look and made it so much more elegant. Did you steal some greens and stick it in your suitcase when you were up here?? It does look great!! Love it! Hi Erica, have you tried zip ties? Then you can hide them with the real greenery.